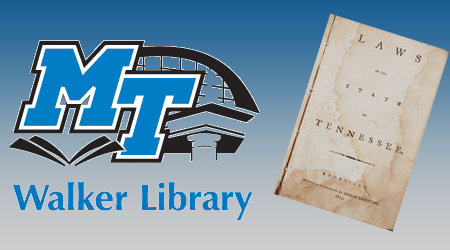 The James E. Walker Library has reached an historic milestone with the acquisition of its one-millionth volume, the first book published in Tennessee, in MTSU’s 100th year. Laws of the State of Tennessee was printed in Knoxville in 1803 by George Roulstone, a native Bostonian who moved his printing press to Tennessee at the urging of William Blount. Blount was governor of the territory south of the Ohio River before Tennessee’s admission to the Union in 1796. Roulstone initially set up the first printing press in Rogersville, in what would become Tennessee, and began printing the Knoxville Gazette newspaper as well as legal and theological works in 1791. Laws of the State of Tennessee was printed on “low-quality handmade paper,” according to Dr. Alan Boehm, director of special collections for the library, and was bound with what appears to be pigskin stretched over pressed sheets of paper to form the cover.